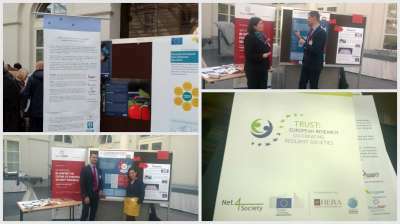 The two-days conference “Trust: European Research Co-Creating Resilient Societies” offered a unique forum to discuss the different perceptions of trust and how research can contribute to fostering trust in societies. The conference focused on how trust can be achieved, what trust is, how research can contribute to fostering trust in societies. 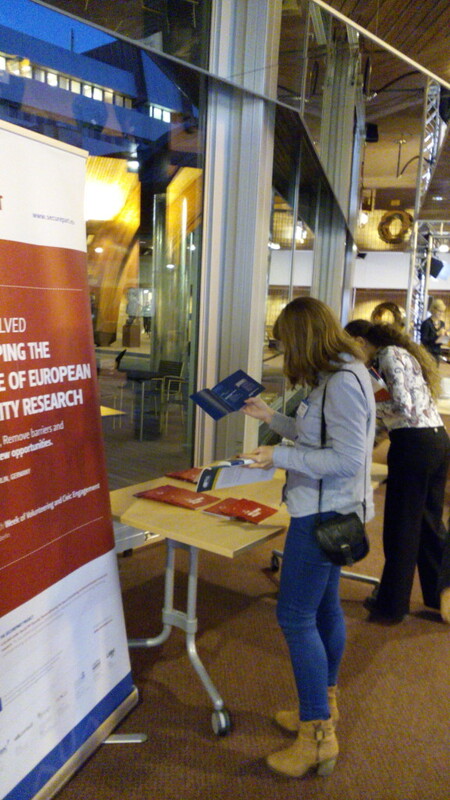 The discussions aimed also to demonstrate how research can have a direct impact on economics, politics and society. “We need to communicate not only to present data & results, but to build up TRUST” (said one of the speakers from the conference). We would add that we need to build up trust and s stronger connection between research-civil society, to make citizens more aware of how research and security research impacts their lives and how they can react and have a say! The consortium was represented by two of the partners, ENNA (European Network of National Civil Society) and GUF (Goethe University from Frankfurt). Posted in Sem categoria on 23 December, 2015 by admin. “The debates emphasized the need to check the cost‐effectiveness of surveillance, the risks of its encroaching into constitutionally guaranteed freedoms, its effects beyond national borders, the way in which it is managed and the central question of proper oversight – parliamentary, judiciary and financial. Even though the debate about surveillance is lively, whistle blowers are still few and no meaningful democratic control can be exercised by civil society. This is because the civil society is not equipped enough to assess the effectiveness of surveillance and its impact on freedoms. Calls for an enhanced civic engagement over surveillance issues can only be made in functioning democracies with sufficient cyber literacy levels. “ (from the preliminary report of the WFD 2015). A series of very important recommendations were being drafted (at the end of 2 intensive days) for national authorities, international organizations, media and civil society. SecurePART consortium was represented by two of the partners (from ENNA-European Network of National Civil Society Associations and GUF-Goethe University from Frankfurt). Our colleague Georgios Kolliarakis (GUF) which was also one of the rapporteurs of the workshops on held under Challenge 1: Ensuring security and bringing surveillance under control, pointed that “in order to involve citizens, in the decision making process, in order to enable them more to control unwarranted surveillance, we need to create better institutional structures and also to foster digital literacy, as a strong way to empower people more”. 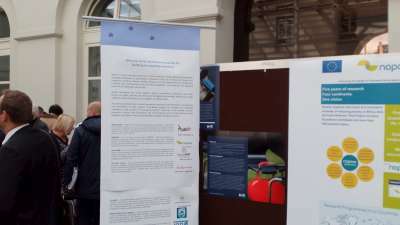 Our project had a good visibility (with hundreds of participants being present at the entire event). On one hand, our consortium members were participating to different workshops, talking about the need to have civil society more involved not only in security research, but also in security-related measures, actions. 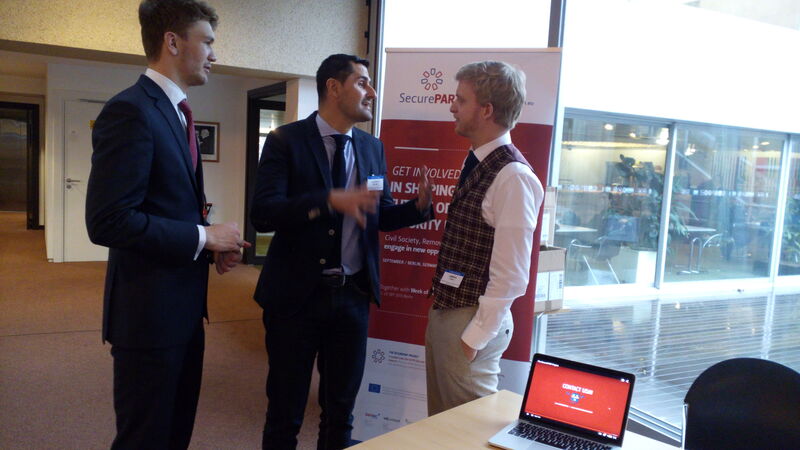 On the other hand, SecurePART had a permanent promotion stand, next to other very important organizations, groups (e.g., FRA – European Union Fundamental Rights Agency). So we had a very huge chance to talk more about our project, our results. For more information about World Forum for Democracy (program, workshops, speakers) visit the event website. Posted in Sem categoria on 22 December, 2015 by admin.